School is almost over and summer vacation is fast approaching. I know most of you are looking for something to do during the school break. Then, why don't you consider attending an acting workshop. 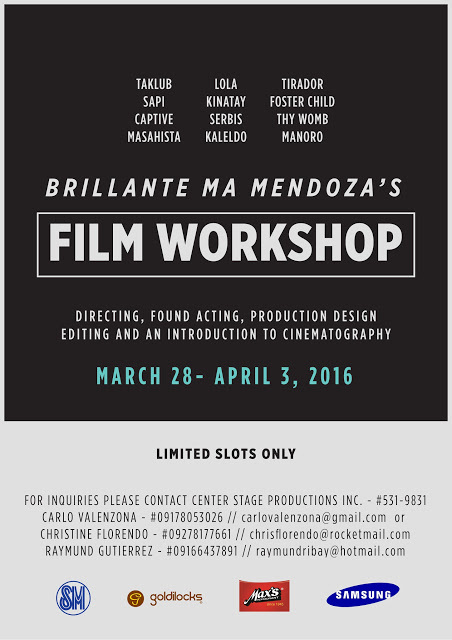 Join the Brillante Mendoza Film Workshop (BMFW), which is a seven days intensive training from March 28 to April 3, 2016, at Center Stage Productions 947 Busilak St. Barangka Drive, Mandaluyong City. **participant is expected to act in the short film made by the directing workshopper at the end of the workshop.